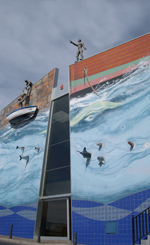 A painting competition with a nautical theme is being organised by the Fisherman’s museum in Puerto Santiago. Only 1 entry per artist is allowed and the theme of the sea, fishing and its arts and crafts and the customs of fishermen are to be shown. Entries are to be handed in from July 7th to July 21st at the Museo de Pescador, in Avenida Quinco Centenario, Puerto de Santiago. The judges will select 40 works of art from those handed in and they will be on display at the museum between the August 4th and 31st. The best 3 will be awarded prizes at a presentation on the final day of the exhibition. 1st prize is a trip to La Gomera for 2 people, staying in the Hotel Tecina. 2nd prize is a stay in the Hotel Playa de La Arena, and the 3rd prize is a weekend in Los Gigantes. For more information, email museo@museodelpescador.com or telephone 671329500. A special exhibition has opened at the Fisherman’s Museum in Puerto de Santiago. It is organised by the Chimisay performance art group, from the North of Tenerife and brings together artists, photographers, musicians and poets. According to the organisers, the objective of the exhibition is to make art fun and to expose people to all forms of art. The exhibition opening hours are Monday to Saturday from 10:00 to 13:00 and 17:00 to 20:00.